You can expect a new liverecording directly from vinyl from the last Vibes Promotion session. OHRWO has played some reggae records at the beginning, including Jah 9, Yabby You, No Maddz, Micah Shmaiah, Infinite, Exile Di Brave, Longfingah and Saraléne. The latter two sing the very important song of refugees. We all can´t understand why such a song must exist in our time. Likewise you should deal with the last Cubiculo record by Maddo aka Bionic Singer. ft. Casino Lover. Just the B side with the incredible extendet dub, skin everyone from the stool. In the second part of the show, all Bass, Dub and Steppa fans will get enjoy oneself. OHRWO deals with the new Radikal Guru album, along with some of the most beautiful records of Wudub? !, Madplate Sound or Squarewave for example. In the end, as usual, something becomes thicker. Have fun listening to & viben. Saralène & Long Fingah called REFUGEES (Free DL) produced by Aldubb from the very well One Drop Label. Deep steeping roots enter than, till OHRWO featured and played the latest release by his musicfriend Hardy Digital the head of Guerilljah Productions. 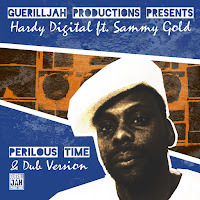 The song Perlious Time from Sammy Gold bring all together we like; reggae, bass, message, voice and vibes! BIG One. This podcast is a stricltly 7 inch run with the two lovely digital promotions. If you have time you should hear it loud. There is no playlist within, please ask us: vibespromotion@googlemail.com or about our page about fb.